Is Ukraine Moving Back Into Russia's Embrace? KIEV, Ukraine -- When hundreds of thousands of Ukrainians took to the streets to protest an allegedly fraudulent presidential election in 2004, the resulting revote was supposed to herald a new era of democracy in the former Soviet republic. 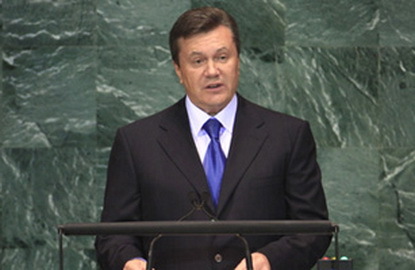 Ukraine's President Viktor Yanukovych speaks at the Millennium Development Goals Summit at the U.N. headquarters in New York City on Sept. 22. Six years after the Orange Revolution, the object of all that public rage, Viktor Yanukovych, is in power, using heavy-handed tactics that he insists are crucial to getting the country's government and economy under control. But critics fear he is reversing Ukraine's path to democracy and turning the nation back toward Russia. Ukraine, a nation of 46 million wedged between Russia and the European Union, was trumpeted as a beacon of democracy in a region of authoritarian leaders when demonstrations against Yanukovych's 2004 victory forced another election, which went to pro-Western Viktor Yushchenko. But Yushchenko's term was widely considered a failure, marked by his inability to overhaul the country's suffocating bureaucracy and overregulated economy or to tackle endemic corruption. Any potential progress was also hampered by constant squabbles with his former Orange ally, then Prime Minister Yulia Tymoshenko. At this year's election in February, Yanukovych — once tagged a Russian stooge — scored a stunning victory to become Ukraine's fourth President. He pledged to bring an end to political wrangling, stabilize the country's wobbly economy and repair relations with Russia while seeking European integration. Since his triumph in a vote widely acknowledged as free and fair, Yanukovych has been quick to stamp his authority. In the past seven months, he has consolidated power by installing a loyal government, appointing allies to key posts in state structures like the state security service (formerly known as the KGB), and, earlier this month, he welcomed a constitutional-court ruling that handed him even more sway, including the power to hire and fire the government at will. "Ukraine and society is tired of life in those conditions ... [which] resulted in economic collapse and poverty," Yanukovych said. He has pledged to use these new powers to push through much needed overhauls. To be sure, his main achievement so far has been to stabilize the economy, which suffered a catastrophic 15% plunge in 2009. He has also put an end to destructive infighting, which in turn has sped up decision making. But opponents claim he is also undermining the democratic gains of recent years, monopolizing power, clamping down on the opposition and curbing press freedoms. They accuse him of getting too cozy with Moscow and attempting to follow the pattern of Russian Prime Minister Vladimir Putin, who crushed his opponents and muzzled the media during his two terms as the country's President. "[Yanukovych's] political culture is to grab more and more power," Hryhoriy Nemyria, a top aide to Tymoshenko, tells TIME. "He is mimicking Russia." In the months since Yanukovych took office, a number of former senior officials from Tymoshenko's government have been put in detention or under investigation on charges of corruption and abuse of office. The former Prime Minister says the charges are trumped up; the government counters that it's fighting graft. Journalists complain of their managers cutting reports that may be critical of the administration, while media monitors say press coverage of Ukraine's government is becoming more deferential. As a result, the country has dropped 42 places to 131 on Reporters Without Borders' annual press-freedom index, which was released on Oct. 20. But while many analysts see ominous signs that Yanukovych is heading down an authoritarian path, others suggest things aren't so clear-cut, pointing out that the President these days cannot ignore Ukraine's newly active civil society. "It's not a steamroller; he's responsive to criticism," says Adrian Karatnycky, a senior fellow at the Atlantic Council in Washington, D.C. "He's aware of the potential of society, which was the lesson of the Orange Revolution." There's no denying, however, that Yanukovych has swung his country toward its former Soviet overlord. Since taking office, he has declared Ukraine a nonaligned country, putting an end to longstanding efforts to join NATO — a goal of all of his predecessors that had enjoyed mixed popular support and irked Moscow. In April, he signed a controversial deal to extend the stay of Russia's Black Sea fleet on Ukrainian territory until 2042 in return for cheaper gas supplies. Yanukovych says the previous administration's failures forced him into the gas trade-off to keep Ukraine's crucial steel mills and chemical plants pumping. Strong leadership and good relations with Russia bring much needed stability, he says, but European integration remains the main strategic goal. Critics, however, claim the President's commitment to Europe is illusory and say that he has given the Kremlin too much too quickly, edging Ukraine toward the point of no return. "Russia views the Black Sea fleet deal as an appetizer," Oleh Rybachuk, Yushchenko's former chief of staff, tells TIME. "They are now trying to get the maximum, which for Russia means total control." Now Moscow is pushing hard for further integration, including mergers of the countries' nuclear-energy, aircraft-building and, most crucially, gas industries. The West, one of the most vocal celebrants of Ukrainian democracy's victory over Russian-backed authoritarianism in 2004, has been more subdued in its reaction to criticisms against Yanukovych. Senior U.S. officials, including Secretary of State Hillary Clinton, have only gently nudged him on press freedoms, leaving some opposition leaders and civic activists to worry that the U.S. is trying to preserve friendly relations with Russia by treading lightly in Ukraine. Meanwhile, Europe, beset with its own internal troubles, professes satisfaction at the stability of Ukraine's current government after years of infighting. "Ukraine is seeing a period of political stability, based on a strong parliamentary majority," said Herman Van Rompuy, president of the European Council, after meeting Yanukovych in September. "This enables Ukraine to move forward with important reforms." Yanukovych is adamant that he doesn't have to choose between the West and Russia. But right now he is negotiating with the E.U. on a deep free-trade agreement at the same time that Russia is pushing him for more industry tie-ups. Soon it could become clearer where Ukraine's President has decided to put most of his chips. THE TITLE TO TEH STORY TELLS IT ALL!! The title says Is UKRAINE moving back into Russia's embrace>?? Well if they get any closer then they should get married but who knows maybe this is good for eastern Europe and others may question it.! PERHAPS strong Ukraine and Strong Russia may be what Europe needas because westsern Europe does not seem to be taking firm stands on anything much lately and RUSSIA like the U.S. is fighting terrorism so this is good.! I mean who really likes terrorism...THE WORLD NEEDS PEACE.and STRENGTH from countries who care.! Have a great day Sincerely!